Fig. 7010 Ejector Venturi Gas Scrubbers are very effective at removing noxious gases, particulates, odors, fumes, and dusts from gas streams. Particulate contaminants are removed through impaction by the high-velocity spray of scrubbing liquid. Gases and odors are eliminated through absorption and/or chemical reaction between the gases and scrubbing liquid. When properly matched to the application, these scrubbers, by their nature, are better able to cope with the high temperatures, heavy contaminant loads, and corrosive conditions often encountered. Fig. 7010 Ejector Venturi Gas Scrubbers offer the following competitive advantages: low initial cost, low energy requirements, simple design with no moving parts which means low maintenance, continuous operation (as opposed to bag houses and precipitators), no electrical requirements, simultaneous gas absorption, and particulate scrubbing. Fig. 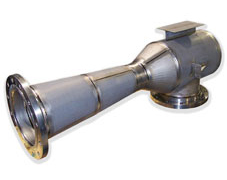 7010 Ejector-Venturi Gas Scrubbers most often operate with a pressure rise or draft. This serves a dual purpose: to boost the pressure of the gas and to clean the gas at the same time. Chlorine gas scrubbing and HCI gas scrubbing. For more detailed information about Ejector Venturi Gas Scrubbers, Bulletin 7S and Bulletin 7S Supp. Literature. To submit a Request for Quote (RFQ) for Ejector Venturi Gas Scrubbers, Adobe PDF or submit an online interactive RFQ Form for Scrubbers.